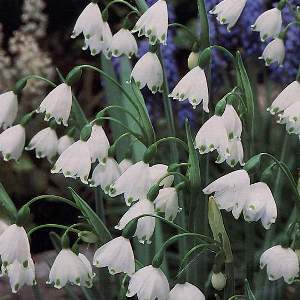 The summer snowflake is the big brother to the snowdrop. The name aestivum means ripening or developing in the summer. Whilst April is hardly the summer it is a lot later than the more familiar winter flowering snowdrop. It is also a much taller plant and this cultivar is larger still – named after the country house of William Robinson, the Victorian exponent of all thing wild in gardening. It is a European native that has established itself in the Thames valley and in Ireland. It needs reliable moisture during its growing phase, but when it dies down in mid summer is happy in dry soils.